High quality fabric.Good dirt resistance,Easy to clean.Not ball.Thick fabric.Feel comfortable and soft.Good air permeability.Using two quality zippers, wear-resistant durable. Understand exquisite life,have simple and open-minded ordinary heart,put down all unnecessary restrictions to experience the spectacular and great life.Show the fashion simplicity,enjoy the quality of life.Customized double-sided printing multi-functional personalized cushion,skin-friendly fabric production,dry and breathable,soft and comfortable,durable and wear-resistant.All kinds of styles are for you to choose,welcome to figure customization.Our company has been pursuing the quality of specialty stores,refused inferior quality.This pillow is a kind of double use quilt cover,do not insolate as far as possible in scorching sun.When catharsis,want to control water temperature.Do not bleach.Do not dry clean. MATERIAL:Multifunctional air-conditioning quilt cushion dual purpose pillow quilt pillow car cushions.The coat of this product is made of plush,which is a new kind of knitted warp knitted fabric.Its appearance is light and clean,soft in texture, not prone to deformation and wrinkle,and it has good air permeability and drape.Its filling material is cotton,with the advantages of heat preservation,air permeability and moisture permeability. DESIGN:The product gathers muti function in a body,pay attention to practicality and ornamental.And support to graph customization.All works originate from our own designers.Moreover,we adopt the most advanced technology in order to present a new and funny world to customer that will enable everyone get immersed in fun and enjoy the joy in life. FUNCTION:This is a practical and beautiful multi-functional pillow quilt. 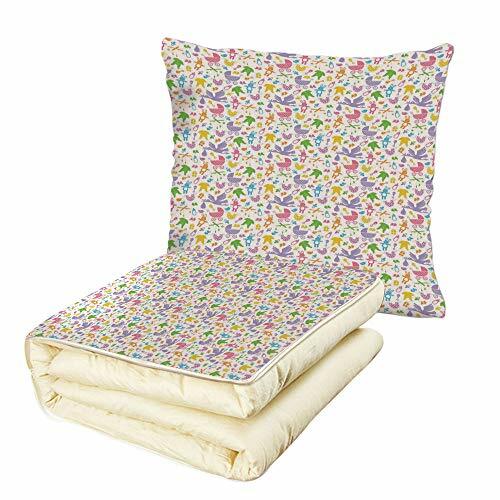 It folds up to be a comfortable pillow(17.71"w by 17.71"h).When unrolled,it becomes a blanket(47.24"w by 59.05"h),and its weight is 24.69 OZ.Suitable for cars/apartments/bedrooms/dormitories/working rooms/dormitories/air-conditioned rooms and home decor,or for traveling and picnics,and even winter soft sheets,soft and comfortable.Besides,the product can also be used as a heartwarming gift for family and friends. NOTE:The digital images we display have the most accurate color possible,however due to differences in computer monitors,we cannot be responsible for variations in color between the actual product and your screen.Due to manual measurement,please kindly allow 1-2 cm discrepancy.